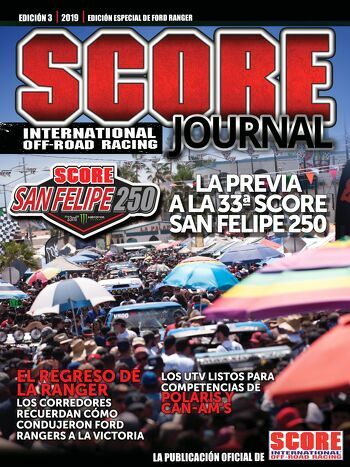 ENSENADA, Baja California, Mexico – After just 10 days of accepting online racer registration, many of the sport’s top figures are among the first 43 official entries for the upcoming 32nd annual SCORE San Felipe 250 in Baja California, Mexico. Starting and finishing for just the second time on the Malecon beach walk in the heart of town, the season-opening event of the four-race internationally-televised 2018 SCORE World Desert Championship will be held April 4-8 in San Felipe, the peaceful fishing village on the Sea of Cortez, 125 miles south of the U.S. Border at Calexico, Calif.
All four 2018 races will be held on Mexico’s magnificent Baja California peninsula for the third consecutive year. At the top of the early entry list for the 2018 SCORE San Felipe 250, which includes racers from 12 U.S. States and Mexico so far are Rob MacCachren, Andy McMillin, Cameron Steele, Billy Wilson, Justin Davis, Dan McMillin, Luke McMillin, Mark Post, Robbie Pierce, Santiago Creel, Said Sanchez, Gustavo Vildosola Sr., Francisco Septien and rookie Liz Karcz. While three racers have three overall victories in the SCORE San Felipe 250, Las Vegas’ Hall of Fame racer Rob MacCachren might have set a standard that will last for awhile, unless he breaks his own record of five overall and SCORE Trophy Truck wins this year. SCORE Trophy Truck, the marquee SCORE racing division for high-tech, 900-horsepower unlimited production trucks leads the early entry list with eight vehicles entered so far. In addition to MacCachren, the other early SCORE Trophy Truck entries are Andy McMillin, National City, Calif. (No. 31 Chevy Silverado), Cameron Steele, San Clemente, Calif. (No. 16 Chevy Silverado), Billy Wilson, Corpus Christi, Texas (No. 15 Chevy Silverado), Dan McMillin, San Diego (No. 23 Ford F-150), Luke McMillin, San Diego (No. 83 Ford F-150), Robbie Pierce/Mike Julson, Alpine, Calif. (No. 30 Ford Raptor) and Mark Post, Las Vegas (No. 3 Ford -150). In the other car/truck/UTV classes, other early entries for the season opener include Justin Davis, Chino Hills, Calif. (Class 1, No. 185 Jimco-Chevy) and Gustavo Vildosola Sr, Mexicali, Mexico (SCORE TT Legend, No. 21L Ford Raptor). In the motorcycle/quad classes, two 2017 season point champions are already entered and one of them, Mexico’s Santiago Creel, is rider of record on four motorcycles in four classes. Creel, an international rally racer from Mexico City, will be the rider of record on two motorcycles in the Pro Moto Unlimited class, one in the Pro Moto 30 class for riders 30 years and one in Pro Moto Limited, the class he was the season point champion in during the 2017 SCORE World Desert Championship. Said Sanchez, Tijuana, Mexico, has already entered the Pro Quad class in his No. 1a Honda TRX450R as the defending season point champion. The Pro Moto Ironman class for solo riders already has three entries including versatile motorcycle racer Francisco Septien, of Ensenada, Mexico, and Liz Karcz, an East Coast transplant living in Albuquerque, N.M.
Septien, 42, has four class wins in this race and will be going for his first San Felipe win in this unique class. Karcz, 34, originally from Passaic, N.J., is a registered nurse who currently works in the ICU department at the University of New Mexico Hospital. This will be her first SCORE race and her goal is to run the entire 2018 SCORE World Desert Championship as an Iron(wo)man while raising charitable funds for the DA8 Strong Foundation. DA8 Strong, founded by former SCORE champion racer Destry Abbott, raises funds to help improve the quality of life for cancer patients and their families. The SCORE Baja 500 is one of the top motorsports events in the world. It was started originally in 1969 by the NORRA organization. Mickey Thompson and his SCORE International organization were invited by the Mexican government to take over the event in 1974. Sal Fish ran and later owned and produced the SCORE Baja 500 for 39 years until he sold SCORE to Roger and Elise Norman in December of 2012. The first Baja 500 organized and produced by SCORE was held on July 26, 1974 as the first of over 150 SCORE Baja races.